"I love Brian Piccolo, and I'd like all of you to love him. When you hit your knees to pray tonight, please ask God to love him, too." Bears running back Gale Sayers uttered these famous words in May 1970, as he accepted the NFL's Most Courageous Player award. Sayers told the crowd they had selected the wrong person for the honor, and would accept it only on Piccolo's behalf. 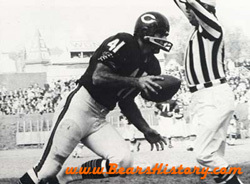 I love Brian Piccolo, too, and a Bears History website could not exist without a tribute to this man. Brian Piccolo typified the legendary Chicago Bear. He was too small and slow to play professional football. What he lacked in size and speed, he made up for in grit and determination. Sadly, Piccolo left this world on June 16, 1970 at the age of 26 after an eight month battle with cancer. Although I was born eleven months after Piccolo died, I've been an admirer of his all my life. Louis Brian Piccolo was born in 1943 in Pittsfield, MA, but spent most of his years growing up in the Fort Lauderdale, FL area. After lettering in several sports in High School, he attended college at Wake Forest University. During his senior season in 1964, Piccolo led the nation in rushing. Despite his fabulous final year in college, "Pic" was not drafted, despite it lasting 20 rounds with 14 teams. Two hundred and eighty picks, and the leading rusher in the nation seemed not to be wanted by the NFL. Bears owner and coach George Halas stepped in and signed Piccolo as a free agent. Halas actually called a press conference to announce the signing, which was unprecedented for a free agent that did not get drafted. Deemed too small and too slow for the NFL, Brian spent 1965 on the Bears practice squad, while that year's number four pick Sayers became the NFL's rookie of the year. In 1966, Piccolo rushed 3 times for 12 yards and was active for all 14 games. In 1967, he rushed for 317 yards and caught passes for 103. Each training camp it seemed he was on the bubble to make the roster, but his determination would not let him fail. His first big chance came in 1968. In game nine of that season, versus San Francisco at Wrigley Field, the "Kansas Comet" suffered a massive knee injury at the hands of 49er Kermit Alexander. Sayers was lost for the season, and "Pic" stepped right in. In the final five games of that year, Piccolo gained 450 yards on the ground and 281 via pass receptions. He also scored his first two NFL touchdowns. Piccolo's good fortune came in the worst possible way he could imagine. Prior to the 1967 season, Bears executive Ed McCaskey suggested that Sayers and Piccolo become the NFL's first interracial roommates. Both players jumped at the opportunity and became close friends. Fiercely competitive, Piccolo was eager to prove the NFL was wrong for not drafting him back in '65, and gaining a starting opportunity due to Sayers' injury was the last way he would have wanted it to happen. During the '68 offseason, Sayers became the first NFL player to successfully return to football after such a massive knee injury. Piccolo assisted Sayers both mentally and physically through his rehab, which was documented in the 1971 film "Brian's Song," as well as the 2001 remake. Sayers was determined to rush for 1,000 yards again after his injury, which he ultimately did. By the time Piccolo had his real chance to shine, it was too late. He entered 1969's training camp healthy and eager to contribute to the team (a full physical and chest x-ray was performed that July and was normal). With Sayers having returned to the lineup, Piccolo was back to his familiar second-string halfback position, but coaches had him practicing at fullback with the intention of playing him there at some point. Starting fullback Ronnie Bull was injured in game six at Los Angeles, so Pic started game seven at Minnesota next to Sayers. Problem was, Brian wasn't feeling well. Piccolo had been battling a cough that wouldn't go away, and now became winded easily. On November 16th at Atlanta, Piccolo took himself out of the game because he couldn't breathe. Coach Jim Dooley knew immediately that something was wrong with the 26-year old running back, as Piccolo had never taken himself out of a game. The following Tuesday, Brian visited Illinois Masonic Hospital to see the team physician, Dr. L.L. Braun. Because of the cough, Piccolo figured they would want to see a chest x-ray, so he headed up to have it taken, and brought the film to the waiting area himself. As soon as he looked at the film, he noticed shadows that were not there just four months earlier. After several days of tests and a biopsy at Illinois Masonic, doctors first informed his wife, Joy, then Brian, of the diagnosis. Piccolo was diagnosed with embryonal cell carcinoma as mediastinal teratoma (embryonal cell carcinoma being the type of cancer, found as a large tumor in his chest cavity.) Piccolo's disease was extremely rare. At diagnosis, it was estimated that there had only been 400 operations of his type performed in the world up to that time. The shocked football player was told that the disease has its roots as the human embryo is developing. In rare occasions, cells are left over in either the testes or chest cavity during development, and uncontrolled growth of these cells is triggered. In the four months since Piccolo's clear chest x-ray, a tumor the size of a grapefruit had developed. It was decided that surgery would be performed at the Memorial Sloan-Kettering Cancer Center in New York the following week. Before the Bears played the Baltimore Colts on November 23rd, Gale Sayers broke the news to the team, and they dedicated the game to Piccolo. In typical '69 Bears fashion, they lost 24-21. Piccolo chided his teammates as they visited him in Masonic after the game. "Leave it to them", he thought, "to dedicate the game to him and lose." On November 28, 1969, Piccolo underwent a 4 and 1/2 hour operation to remove the tumor from his chest. Although during surgery doctors were concerned to find a lymph node that tested positive for cancer, they were optimistic that the operation was a success. Piccolo was discharged, given a regimen of chemotherapy, and would return to Sloan-Kettering in June 1970 for an evaluation on his future in football. Piccolo intended to return to football in 1970, and felt that there was no way that he would let even an enemy like cancer beat him. He began working out again in January of 1970, and started anew his usual round of speaking engagements for a variety of organizations. Often he would bring to these speeches his friend Morey Coletta, who happened to be an undertaker. Piccolo loved to warm up the crowds by telling people that while athletes and movie stars traveled with their agents and attorneys, he brought his personal undertaker. In February, Piccolo was invited to a celebrity golf tournament in Phoenix, where he played for three days with Chicago Cub Ernie Banks. After the second day, he discovered a lemon-sized lump on his chest. As soon as he returned to Chicago, he had it checked out by a doctor friend, who stated it could be a pulled muscle. Another chest x-ray revealed spots within the left lung in addition to the pectoral mass. While he knew he had to immediately fly back to New York for diagnosis of this re-occurrence, he still took the time to speak to some children with scoliosis. He related to them the importance of positive attitude to overcome disease, and children streamed out of the room full of encouragement. The rapid recurrence and spread of his cancer was confirmed in New York, and Brian underwent a month of intensive chemotherapy there. The disease didn't respond, and on March 24th, he underwent a mastectomy and the removal of lymph nodes in his left chest. As if a once-strong athlete having to endure the removal of his breast wasn't enough, just weeks later, doctors informed him that they felt the need to remove his left lung entirely. Although always optimistic around Piccolo, the cancer specialists confided to Joy, McCaskey, Sayers and others that there was a limited chance to save Brian's life. That would be if they could remove the lung, implant the remaining tumor with radioactive seeds, and administer radiation therapy. With this announcement to Piccolo came his first public acknowledgement that he could never play football again. This would be the hardest realization for Brian-as he would never accept that cancer would ultimately defeat him. On April 9th, his left lung was removed, and residual tumors were implanted with radioactive iodine seeds. After nearly a month of radiation therapy, Piccolo's body was battered. He was allowed to return to his home in Chicago on May 23rd, and he and his wife soaked up the beautiful spring weather. On May 31st, they left to spend a week in Atlanta with Joy's parents and their three daughters, Lori, Traci, and Kristi. By June 4th, Piccolo was back in the hospital in New York. Doctors told Joy the cancer had spread this time to his liver, and not to expect Brian to live too much longer. According to Jeannie Morris, author of Brian's biography Brian Piccolo, A Short Season , Piccolo fought kicking and screaming to the very end. But he never lost his sense of humor, even at the most dire time of his life. When Ed McCaskey finally broke into tears at his bedside, Brian said "don't worry Big Ed, I'm not afraid of anything. Only (Packer linebacker Ray) Nitchke." Brian Piccolo finally succumbed to his disease on June 16, 1970 at the age of 26, leaving his wife and three daughters he loved and cared for dearly. Chicago mourned, and a year later he became a legend. The television movie Brian's Song was released in 1971, starring many of his teammates, James Caan, Billy Dee Williams, and others. The movie was remade in 2001, exposing a new generation to Piccolo's remarkable story of courage, humanity, and faith. Embryonal cell carcinoma was almost 100% fatal at the time of his diagnosis. After Piccolo's death, the Brian Piccolo Cancer Research Fund was established, and millions of dollars have been donated to the cause of finding a cure to various forms of the disease. Thanks in part to funds raised in Piccolo's name, with early detection and treatment, this disease is now almost completely curable. I first read Brian Piccolo, A Short Season, and Gale Sayers' autobiography I am Third when I was nine years old, and saw Brian's Song for the first time at 10. I read Piccolo's book again this Fall, after watching the ESPN Sports Century special on his life. The special featured comments from his three grown daughters. Just a few days after watching the special, I was walking out of Soldier Field with an excited throng following the Bears' overtime win against Cleveland. I spotted an attractive young woman wearing a Piccolo 41 jersey, and was almost positive it was his daughter Kristi. I wanted so much to tell her the respect I have for her father, and how I sobbed watching the special, but it's not my style to encroach on anyone's privacy like that. I mention in the headline that Brian Piccolo is one of my "heroes". From my childhood to the present day, I have never taken a sport figure as a hero based on the fact that they're successful at a game. I will not raise my young son to worship another human being, especially a sports figure or celebrity. L. Brian Piccolo's story trancends this. The millions of people that have read his story know that he taught us how to live, love, care for his fellow man and carry out the ultimate display of courage in the face of the demise every human being will someday face. To me, this man is a hero to us all. Should anyone from Piccolo's family read this, please know my respect for Brian Piccolo. If only I can live my life with 10% of his strength, courage, faith, and goodwill to man, I'm sure I'll get the chance to meet him on "the other side". "The guys, by and large, were all pretty straight. You know how it is--when you mention the word 'cancer' everybody starts diggin'. Hell, they didn't know if it was the last time they were going to see me or not, but I knew it wasn't. I've just always had the feeling that my time wasn't here. I've got too many things to do yet. I'm just not ready." -From "Brian Piccolo A Short Season", Jeannie Morris 1971. Piccolo was born in Pittsfield, MA in 1943 and grew up in Fort Lauderdale, FL. He attended Wake Forest University and led the nation in scoring in 1964. Despite this, he was not drafted by the NFL in 1965. Future teammate Gale Sayers was selected fourth overall by the Bears that year. After slowly blossoming with the Bears from 1966-1969, Piccolo was diagnosed with Embryonal Cell Carcinoma in November of 1969. Piccolo died in June 1970 at the age of 26. Bears owner George Halas picked up all of Piccolo's medical bills. The St. Louis Cardinals scrimmaged the Bears in Rensselaer, IN in August 1970, donating the proceeds to the Piccolo family. Piccolo's wife Joy remarried in the early 1970's. His three daughters attended Wake Forest. Gale Sayers remains visible in the Chicago area and has run a successful high-tech company, the Sayers Group, for years. An annual golf outing in Piccolo's memory was established in the early 1970's, as was the Brian Piccolo cancer research foundation. Every year, one rookie and one veteran from the Bears is given the Brian Piccolo award. The player should exemplify the strength, courage and determination of the late running back. About Bill In her book Brian Piccolo A Short Season, Jeannie Morris notes that just several days before his death, Brian Piccolo received a blood transfusion from a man that was cured of embryonal cell carcinoma. Unfortunately the transfusion did not work for Piccolo, but his donor was truly cured of the disease. Here is his story as written by his widow Joan. ESPN Story This story on ESPN.com was written in 2001, when a Sports Century special about Piccolo aired. Photos Here are additional photos of Brian Piccolo I have collected.